2015 three CD set. 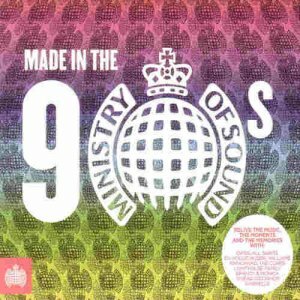 Ministry of Sound presents Made in the 90s, a release that documents one of the most influential decades of popular music in history. An all-encompassing collection of tracks offering dance floor favorites, indie-pop hits and a solid selection of R&B and soul. Relive some of your favorite memories with music from artists such as Oasis, All Saints, The Cardigans, Robbie Williams, Radiohead and Shola Ama. It's the perfect sing-a-long, feel-good, dance around soundtrack and features familiar hits associated with some of the greatest '90s chick flicks of all time. This includes the ultimate teen movie anthem 'Kiss Me' by Sixpence None The Richer, which was famously featured in the iconic film She's All That. This release harks back to a time of MTV, Nickelodeon, crop tops, Gameboy's and Reebok classics. There is no denying Made in the 90s perfectly defines the decade and is a must buy for those who want to reminisce about good times. Relive the music, the moments and the memories with Made in the 90s, from Ministry of Sound.